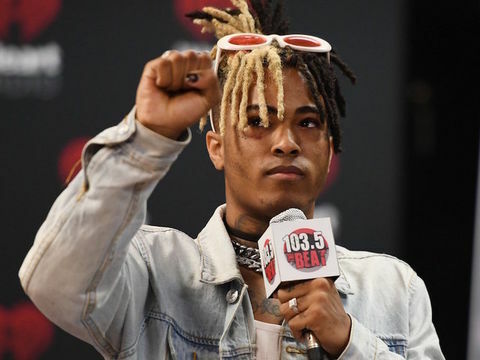 WEST HOLLYWOOD, Calif. -- (KTLA) -- Hundreds of mourners amassed in the Fairfax area of Los Angeles on Tuesday to pay tribute to rapper XXXTentacion, who was fatally shot during an apparent robbery in Florida the day before, and were ultimately pushed from the area by police after the gathering grew unruly. At least 300 people had flooded Melrose Avenue, near the intersection with Spaulding Avenue, when authorities were called in around 7:50 p.m., said Los Angeles Police Officer Tony Im. A memorial was scheduled to take place from 8 p.m. to 10 p.m. in a storefront at 7669 Melrose Ave., according to a Facebook event page. Those gathered were blocking traffic and intermittently moshing in the street before officials were heard ordering them disperse. Many were simply standing in the street, but some of the more energetic individuals could be seen on nearby roofs and scaling a taco truck parked within the throng. The crowd grew to 1,000 people, Im told the Los Angeles Times. Officers formed a perimeter around the area and appeared to be firing rubber bullets into the crowd, pushing it east down Melrose. One young man who was there said non-lethal rounds were used. Despite the increasing police pressure, a nucleus of revelers who remained didn't appear ready to vacate the street. Several were seen jumping atop vehicles that managed to pass through the area. But by 10:15 p.m. LAPD had mostly cleared the area. Though smaller groups of mourners remained clustered along the avenue, they were huddled over memorial candles. No arrests were made, according to the Times. The 20-year-old rapper XXXTentacion, whose real name was Jahseh Onfroy, was leaving a motorsports store in south Florida when he was gunned down by two men in a dark-colored SUV on Monday, Broward County sheriff's officials said. Authorities are now searching for suspects in the case.